(Open Box) Studio sound on stage. The Blue enCORE 100 is a studio-grade handheld dynamic microphone for all-around vocal performances, no matter the application. enCORE mics offer everything you’ve always wanted and never found in stage mics: lush, vibrant, and punchy studio reproduction with unprecedented clarity, detail and headroom. In short, enCORE is the stage mic that speaks like a studio mic. Don’t settle for popular mics that make you sound like everyone else— pick up an enCORE and let your true voice be heard. 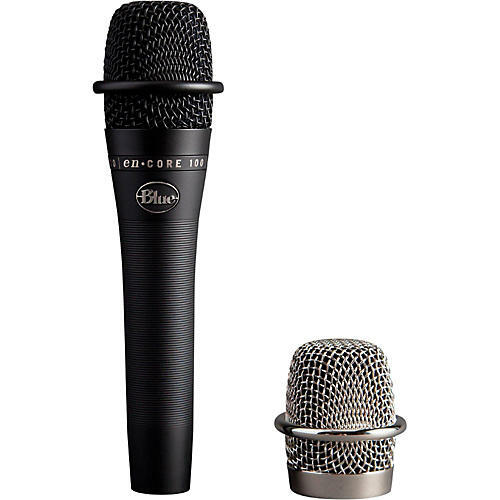 The enCORE series brings Blue’s legacy of industry-leading innovation and unmatched quality to the live arena. These stage mics feature custom Blue components, hand-selected capsules and innovative features you simply won’t find in ordinary live mics. The four enCORE models cover a wide range of applications—from lead, backing, and choral vocals to high-SPL guitar cabs, drums and acoustic instruments—all with the sonic sensibility and presence of studio condenser mics. enCORE mics are built to withstand the rigors of the road. Every durable detail, from the heavy-gauge barrel construction and specially designed reinforced grill, to the hardened metal-plated finish is road-tested by some of the industry’s biggest names. No matter what they’re put through, enCORE mics are always ready for the next performance. Big vocal sound, a great alternative to what you've been told you need.